I’ve been feeling nostalgic lately, craving comfort foods, making lots of casseroles, and thinking about recipes that were popular during my adolescence– those fabulous decades known as the eighties and nineties. 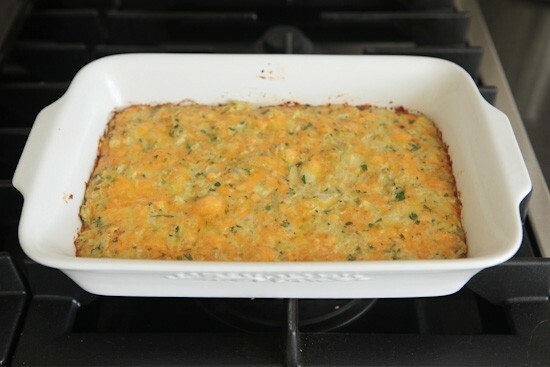 It was in this spirit of reminiscence that I was drawn to a familiar recipe called Artichoke Squares that I found while flipping through one of those spiral-bound fundraising cookbooks that someone left in the kitchen at our cabin. 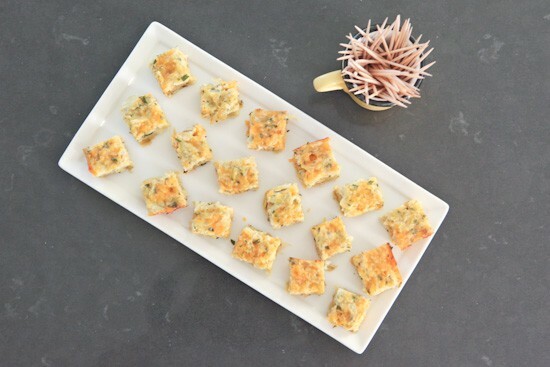 I can’t remember my mom ever making artichoke squares and it’s not something I’ve ever made myself, but I can certainly remember eating plenty of those delicious little bites at parties and potlucks. Reading the recipe instantly transported me back to my youth when all things were improved with the addition of marinated artichoke hearts (or sun-dried tomatoes, of course). 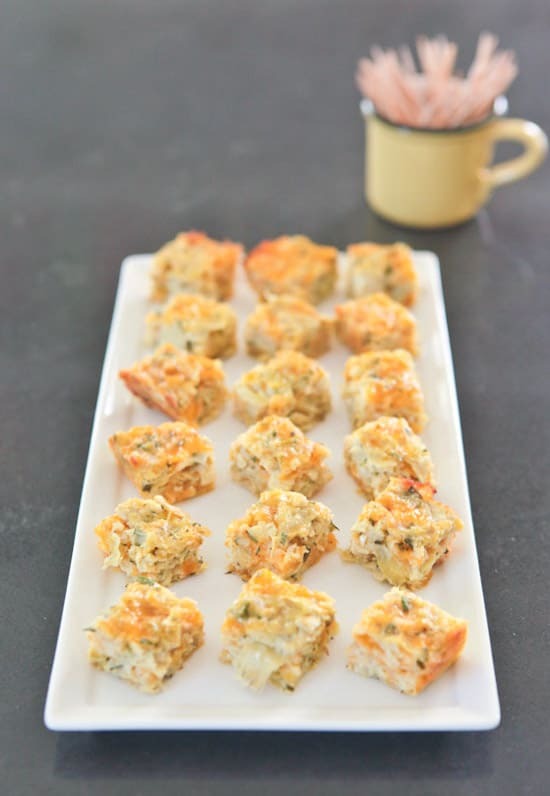 I still believe that many things can improved with artichoke hearts and sun-dried tomatoes and I also think that this recipe, although not the most beautiful appetizer, is delicious and easy and should be made soon and shared at your next gathering. The original recipe calls for two smaller jars of marinated artichoke hearts, but I chose to use a can of artichoke hearts in water, which is much cheaper and works perfectly. 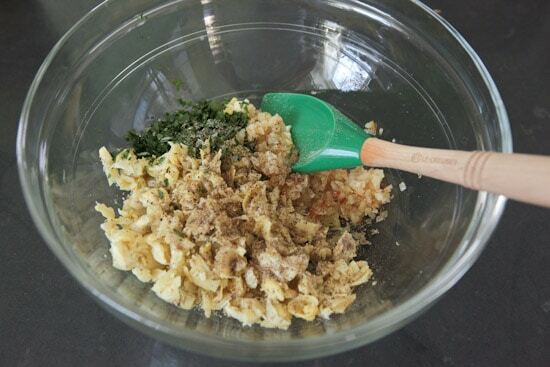 You’ll also need fresh onion, garlic, and parsley, four eggs, half a pound of sharp cheddar, some dried bread crumbs, dried oregano, hot sauce, salt and pepper. 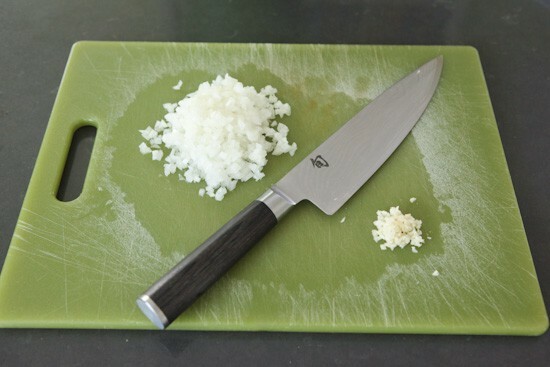 First you’ll mince half an onion and one clove of garlic. 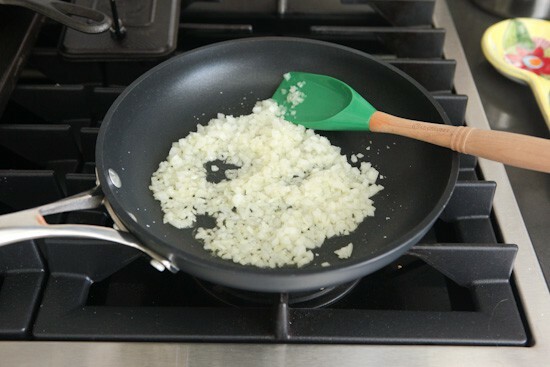 Heat a tablespoon of olive oil in a skillet and sauté the onion over medium heat until soft and just starting to brown. 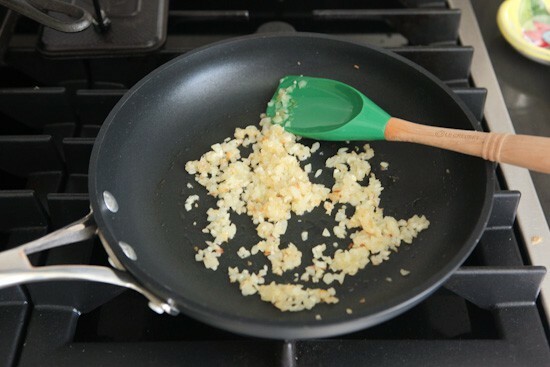 When the onion is soft and starting to take on a bit of color, stir in the garlic and cook for about a minute, just until the garlic is very fragrant. Remove pan from heat and set aside to cool for a bit while you chop up your artichoke hearts and parsley. To the chopped hearts add the cooked onions, minced parsley, salt, pepper, and oregano. Stir well. 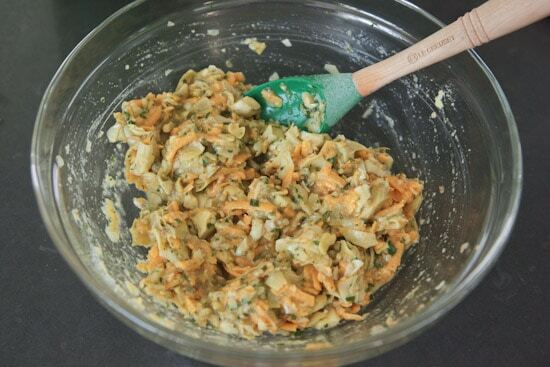 Whisk the eggs and a dash of your favorite hot sauce together in a separate bowl (not pictured) and then add to the artichoke mixture. 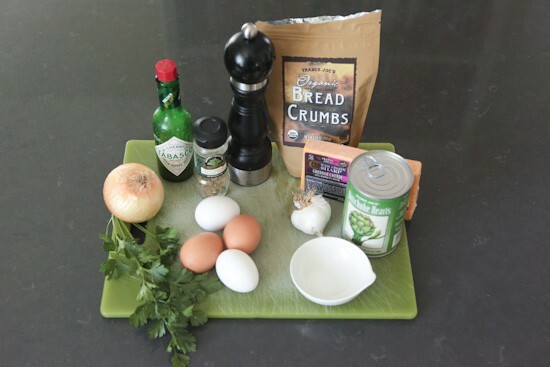 Don’t forget the dried bread crumbs (I almost did!). 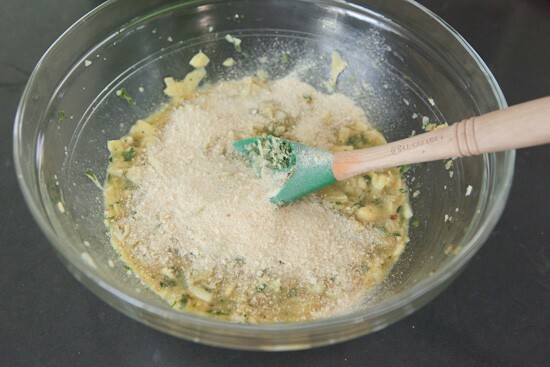 Stir up the eggs, crumbs, and artichokes until everything is well distributed. 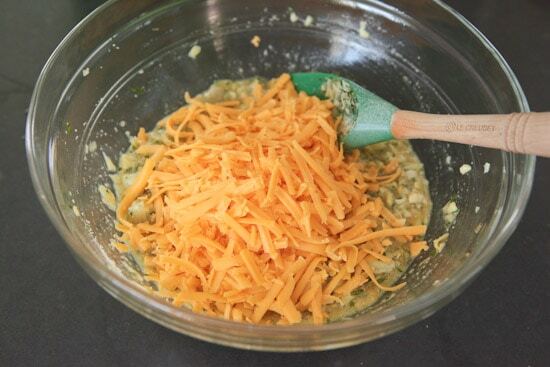 And finally add some grated cheddar cheese. I like to use orange cheddar to give the artichoke squares some color. They need all the help they can get when it comes to appearance! Give everything one last stir and look over the ingredient list once more to make sure you didn’t forget anything. 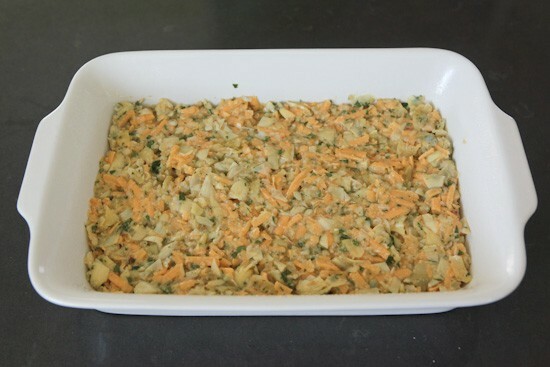 Spread mixture into one of your smaller casserole or baking dishes (don’t forget to grease it). Mine measures about 11 x 7 inches but you can also use an 8 x 8 or 9 x 9 inch square dish or metal pan. Bake at 325 degrees for 30 minutes. Let cool in baking dish for a few minutes before cutting. They are delicious served warm, but just as good at room temperature, in my opinion. We also enjoyed them cold, straight out of the refrigerator. Cut into bite size pieces for appetizers or larger pieces for meals or snacks. Enjoy! Preheat oven to 325 degrees. Spray a 1 1/2 or 2 quart baking dish or pan with nonstick cooking spray (11 x 7 inch rectangle, 8 inch square, or 9 inch square pans will all work). Heat olive oil in a skillet over medium heat. Cook onion until softened and just starting to brown a bit. Add garlic and cook for another minute. Remove pan from heat and set aside. 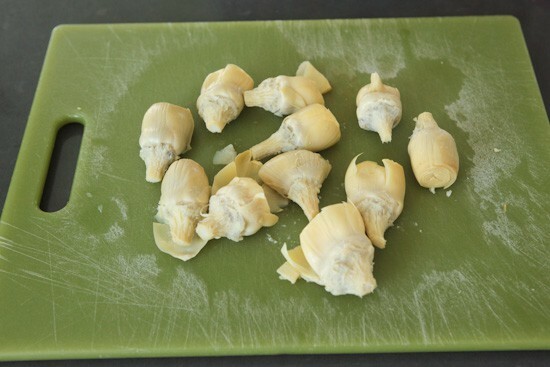 Drain the can of artichoke hearts and pat them dry with a paper towel. Chop the hearts up into small pieces and place in a mixing bowl. Add minced parsley, salt, pepper, and oregano. Stir everything together. In a separate small bowl, whisk together eggs and hot sauce. 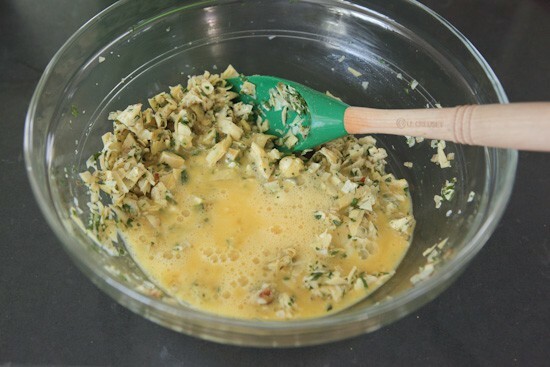 Add eggs to artichoke mixture along with the dry bread crumbs. Stir well to combine. Stir in cheddar cheese. Spread mixture evenly in baking dish and bake at 325 degrees for 30 minutes. Let cool in pan for a few minutes before cutting and serving. If making ahead of time, cool in pan, cover, and refrigerate. When ready to eat, reheat in oven just until warm, then cut and serve. Leftover individual pieces can be reheated briefly in the microwave. We think they taste good cold, too. Don’t miss out on upcoming recipes! Subscribe to Pinch My Salt by email to be notified of new posts. Bringing back the classics! I'm all for that! subbing almond flour for the bread crumbs: grainfree n thus glutenfree too :) looks fantabulous! These look amazing. I am always looking for new and different appetizers that can be made ahead of time so you are not running around when the guests arrive. I think I'm going to try them and eat them before all the guests arrive! Thank you! Awesome recipe. Really liked the easy steps. Thanks for sharing this! Wow that's really simple to make and i never use artichoke hearts! (so good time to try) Pinned and saved! You can use any of the above listed dip mixes and coimbne with the sourcream for the coating. These and others are availible in our store along with Cheeseball mixes that I am sure would work. Looks like a yummy recipe. Regarding appearance, what if you baked them in a mini muffin tin ? Polopoly- I think that these would work well in a greased mini muffin tin, but I haven't tried it so not sure what to recommend for a baking time. Let us know if you try it!